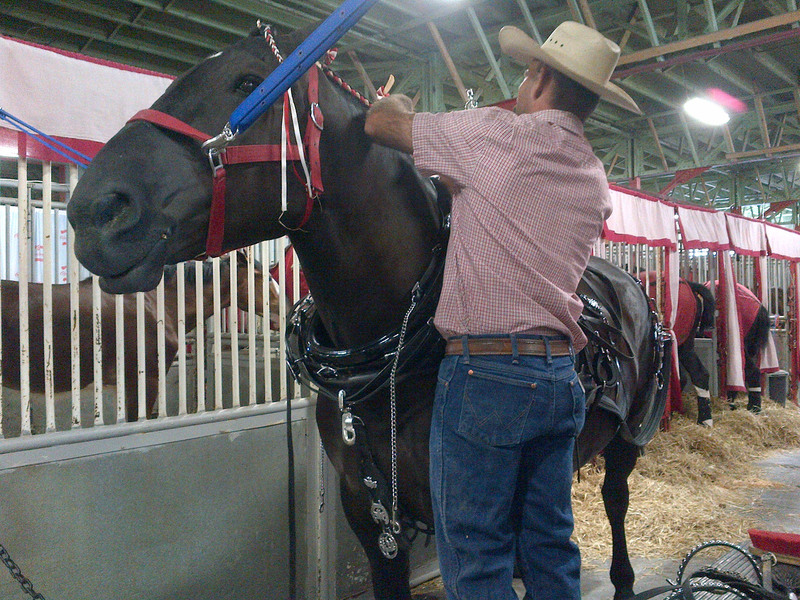 After 100 years agriculture is still the backbone of the Calgary Stampede. 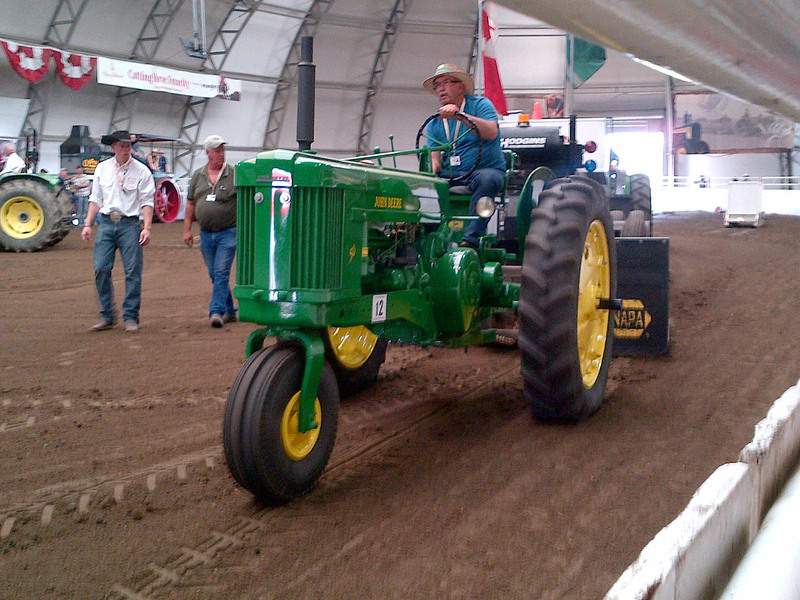 Alberta Premier Alison Redford said it best during the Stampede, “This province is based on agriculture. You’ve gotta go to the barns!” And hundreds of thousands of people did just that. 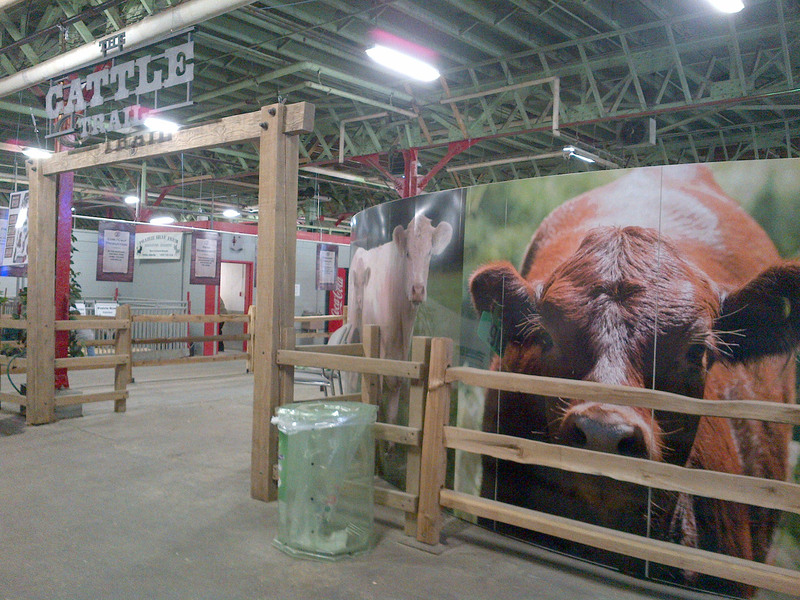 Many Stampede attendees took a walk through the Stampede barns to see the animals up close or meandered through Ag-tivity in the City to learn more about agriculture or took in one of the many ag-related events happening around the park. The Stampede exposes many urban people to agriculture (and for some its their first taste of ag). I had the opportunity to volunteer with the Agriculture Media committee for three full days during the 10-day event. I quickly became familiar with the grounds, the events and met many friendly people. The committee was a perfect fit for me combining my love of agriculture with my passion for communications. I had a great time and look forward to next year. Zip Line! I love exciting extreme adventures! 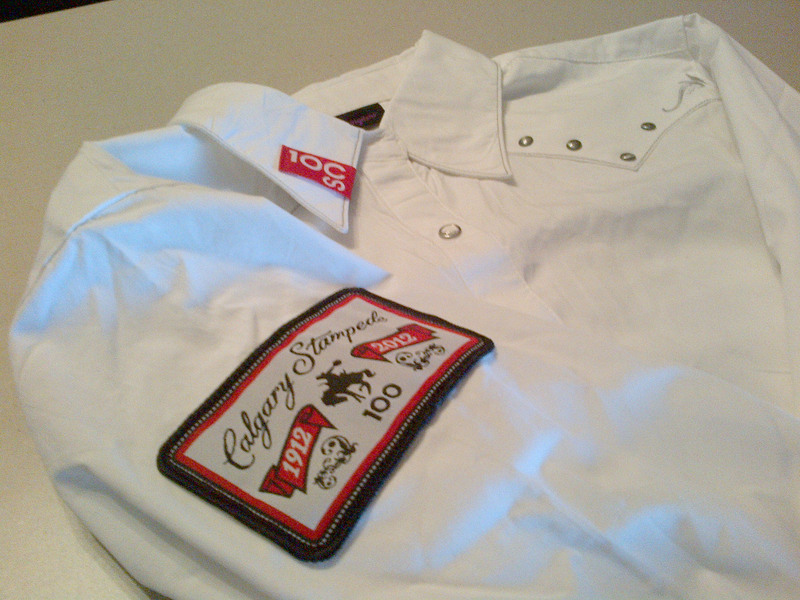 My Calgary Stampede volunteer shirt. Up, up, up… The Stampede temporary zip line, which I went on of course! 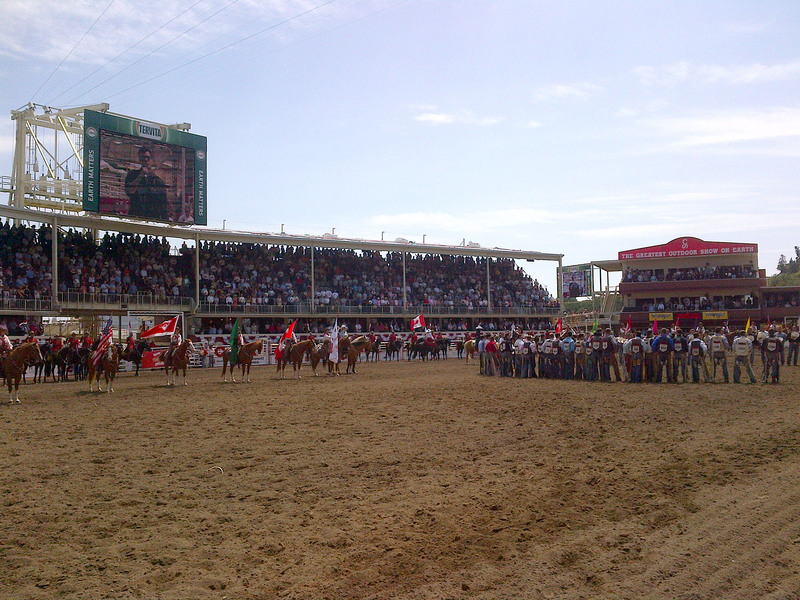 The opening of the rodeo. 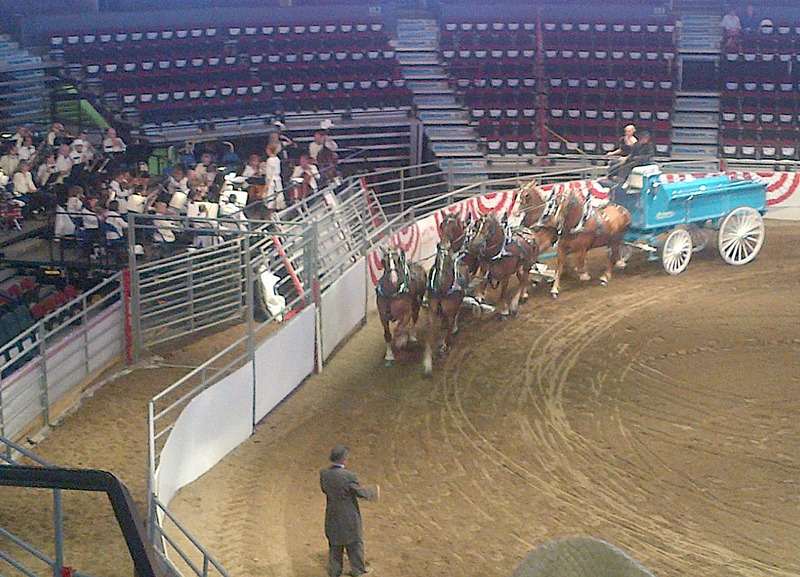 A six-horse hitch taking part in the Heavy Horse Show featuring the Calgary Philharmonic Orchestra (left side of photo). There were beautiful horses everywhere. 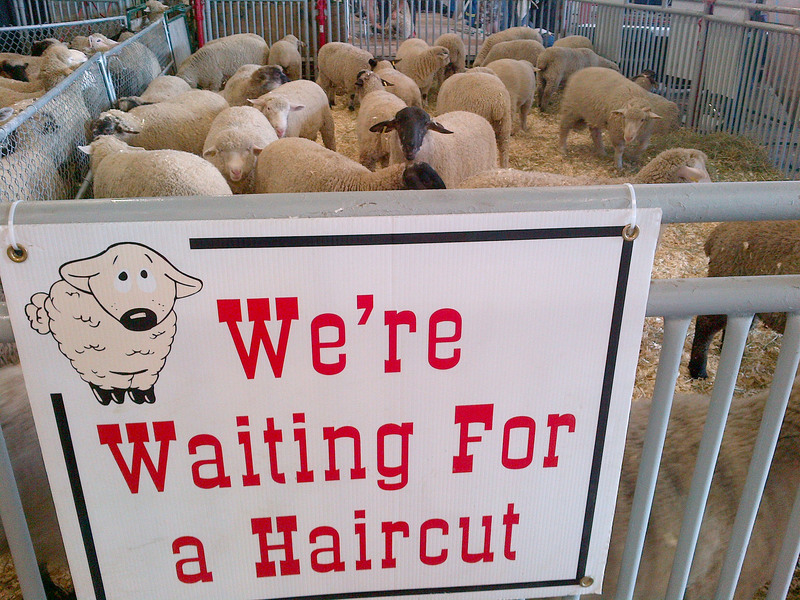 These sheep are ready to be sheared, especially on a hot day. 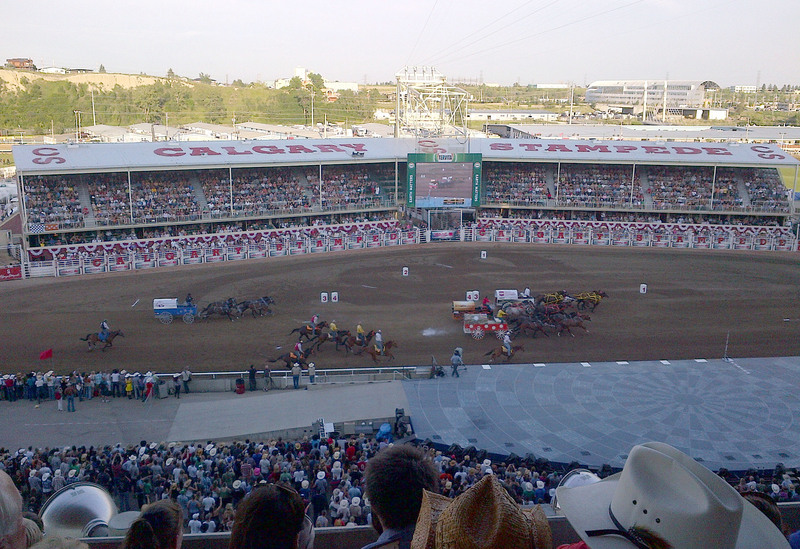 The GMC Rangeland Derby chuckwagon races. 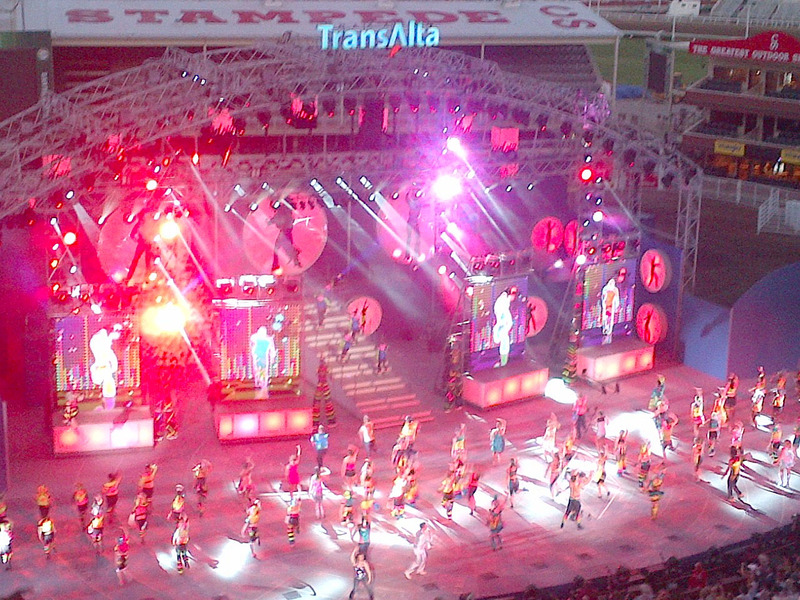 The TransAlta Grandstand Show called Century featuring Paul Brandt and The Young Canadians. 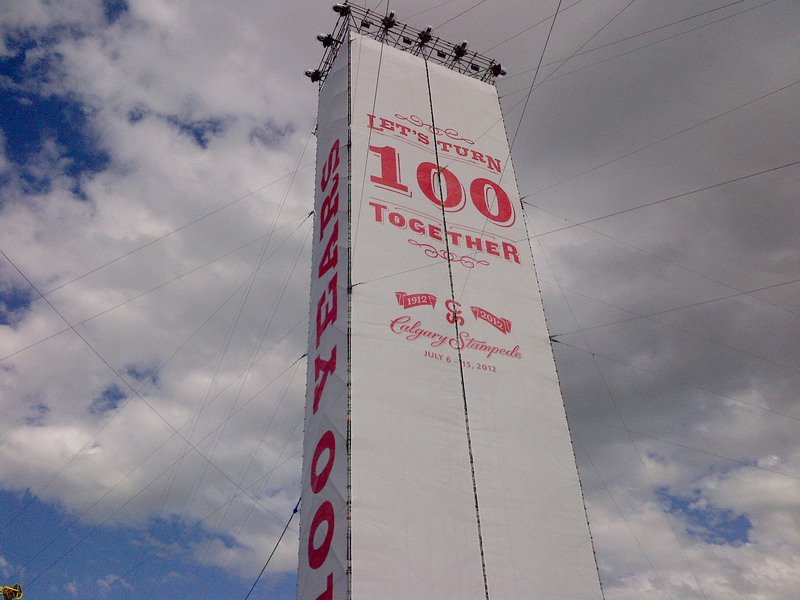 Happy 100th Birthday Calgary Stampede! 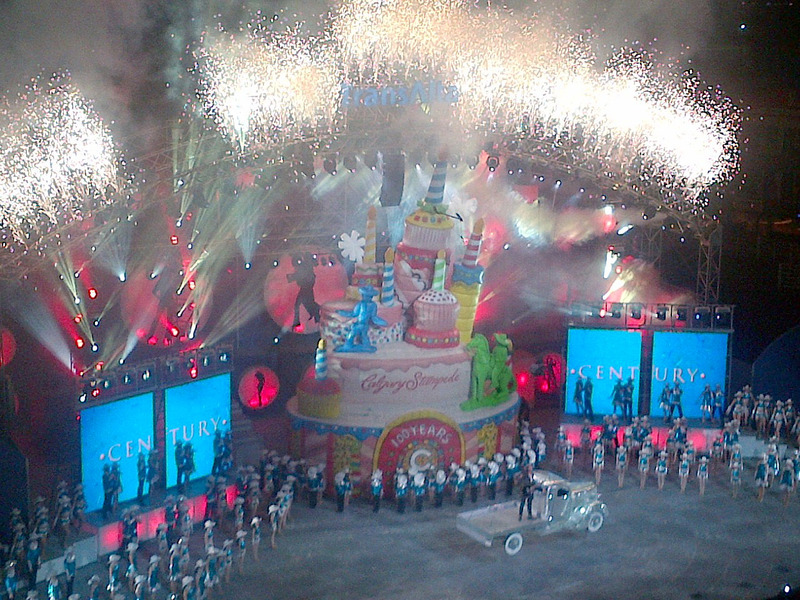 Now that’s a huge cake! 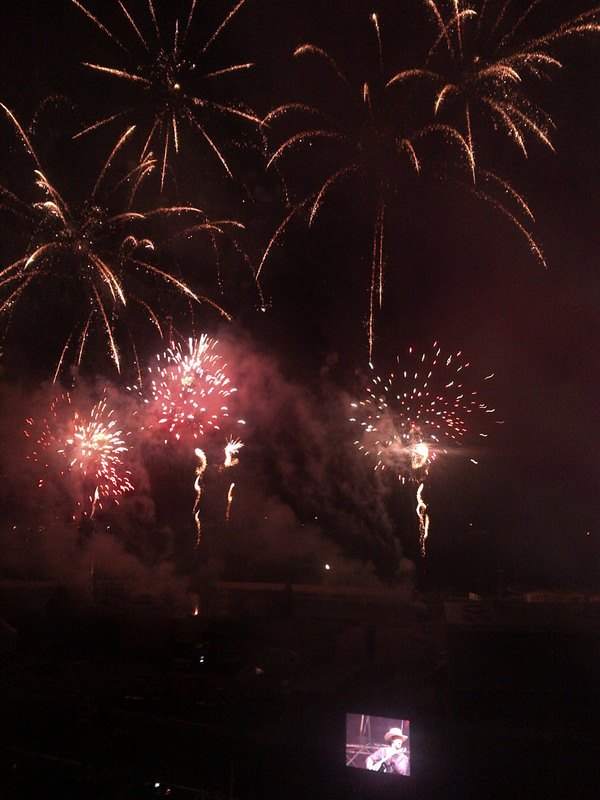 Some of the amazing fireworks. 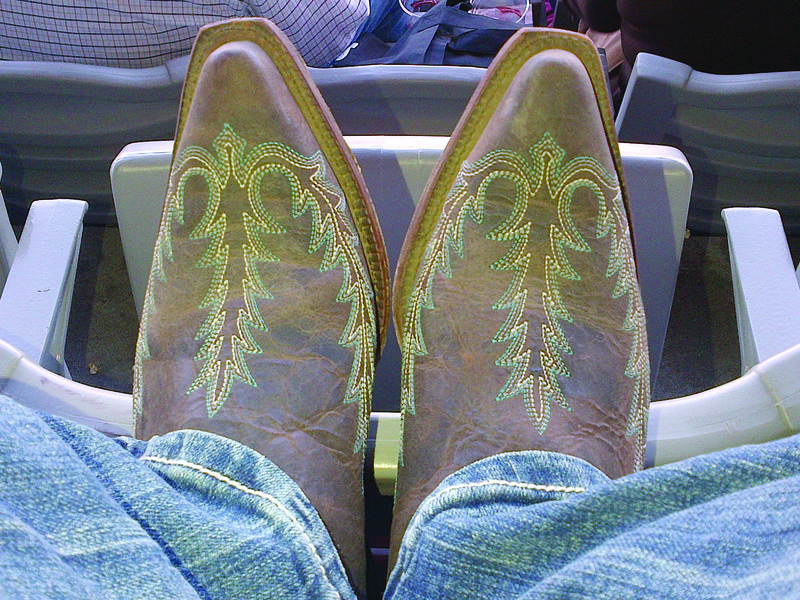 After four days of wearing my new boots, I think I’ve finally worn them in! Love it! Thanks for sharing, Teresa! 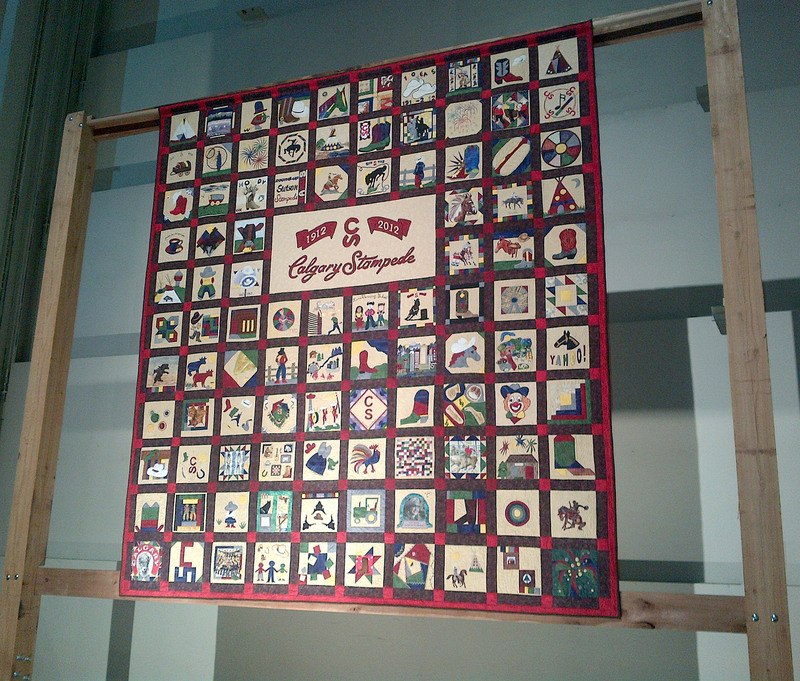 A great overview of a truly great 10 days! Thanks Cami! It was a great experience!